Technology can enhance learning and teaching for students, but it can also be leveraged for the learning and teaching of teachers. The web is full of online resources for teachers looking to learn something new, relearn some content, or connect with other teachers. The amount of information can be overwhelming. This month, I am highlighting two of those resources. The Teaching Channel offers free professional learning through searchable video covering multiple age levels and subject areas. 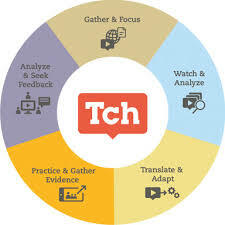 The Teaching Channel supports its Theory of Professional Learning by offering tools that assist teachers at each phase of the learning cycle. Looking for a place to start? Try Mingle and Count, an elementary number sense lesson, or Algebra Mixture Problems, a way to teach the classic word problem using conceptual understanding and mathematical structures. Both videos show how teachers can engage learners in understanding the mathematics of a lesson, can support new learning through experience, and can scaffold future learning through accurate use of language and models. Research shows that the use of manipulatives in the mathematics classroom, used as concrete representations of mathematics concepts, is an important first step for understanding among students with special needs. Research also shows that the use of virtual manipulatives is also effective with this population. That same research has found that using concrete and virtual manipulatives together has maximum benefit for students with special needs. Annenberg Interactives is a searchable collection of virtual manipulatives and applets that teachers may use to teach mathematics at all age and ability levels. When users select an interactive, they will find a variety of support materials including step-by-step directions on how to use the interactive to teach, sample problems, problems to give to students for independent practice, videos demonstrating the use of the interactive in classrooms or professional learning settings and opportunities for reflection. Tagged Annenberg Interactives, Kate Fanelli, The Teaching Channel. Bookmark the permalink.